Americans are no strangers to cooking outdoors, especially in the summertime. Ever since the Food Network started, we couldn’t resist watching Bobby Flay preparing a great BBQ on the rooftop. We also can’t help but watch do-it-yourself channels, showing off different people’s ideas and designs of outdoor living spaces. Who wouldn’t want to have their own outdoor family room? Or better yet, the ultimate outdoor kitchen? If you’re a homeowner with an open canvas in your backyard, then it’s time to do something about that space, right? Keep in mind that this style of outdoor cooking has become a popular trend in the US. It’s not that you want to keep up with the Jones’s, but a matter of having a backyard up to your specifications. An outdoor kitchen is perfect for entertaining family and friends. When you have food grilling in your patio, it helps to gather your guests around the area and socialize. Contrary to an indoor kitchen, there’s so much space outside; increase the comfort by adding patio heaters, fire pits, outdoor furniture, and more. Did you know that an outdoor kitchen increases the value of your home? This is because most BBQ grills and other appliances are made from stainless steel. That’s right! Stainless steel appliances are easy to clean and makes them able to handle the changing temperatures of the seasons. A functional outdoor kitchen is an investment you can use and enjoy for many years to come. An outdoor kitchen doesn’t heat up like an indoor kitchen does, especially in the summer. If you happen to bake, fry, roast or broil foods in your indoor kitchen, your AC goes into overdrive. Remember, you don’t want to pay extra on your next electric bill. Imagine this: the smell of grilled meat, fish, poultry, and veggies. Doesn’t it make your mouth water? But, do you want those odors to linger in your house for days? I don’t think so. It’s better to cook outside and keep your home smelling fresh. Better than a loft and no need to add walls, add the space you already have in your backyard. If you happen to have a roofed terrace, even better! Just add a grill and appliances and have the outdoor kitchen you always dreamed of. Wouldn’t it be great to have dinner parties and celebrate birthdays and holidays outdoors? Grilling enhances the taste of food and is better for your waistline. Why? When you grill meats, the fat drips off, and the result is a healthier and tastier meal. Now isn’t that good? It’s proven that homeowners who have an outdoor kitchen and an outdoor living area go out to restaurants for dinner less often. Let’s face it, eating out at restaurants can empty your pocket very fast, especially on a regular basis. Remember, you have the best restaurant in town and it’s in your own backyard. Having an outdoor kitchen helps you keep your dollars in your wallet by not going out to eat as much. It doesn’t have to be all of them, but you can get started with a few. Also, keep in mind that designing your outdoor kitchen has a science behind it. It is always good to have a designer to walk you through the process and help you prepare a sketch based on the dimensions and specifications that you’re looking for. In that way, a professional layout can even ensure the purchase of the right appliances and accessories. Remember not to forget that ventilation is key to a great outdoor kitchen. Another critical factor in designing an outdoor kitchen is changes in the weather. We highly recommend that you purchase your outdoor kitchen appliances built in stainless steel. Stainless steel appliances will not only add value to your outdoor area and home but will also hold up to Mother Nature’s seasonal changes. How large of a grill you need or want is up to you. If you have a huge gathering, you may need a larger size. If you only plan on cooking for your immediate family, you can probably go with a smaller barbecue. No outdoor kitchen should be without a fryer. A fryer will give you the option to prepare some hors-d’oeuvres or French fries. Also known as artisan fire pizza, it is becoming a huge trend when it comes to outdoor cooking. Now you can enjoy a gourmet pizza right in your own backyard. Outdoor pizza ovens are available in both gas and wood versions. Countertops are crucial when it comes to your outdoor kitchen. Outdoor kitchen countertops need to be durable to the outdoor elements, able to hold up to all changes in the weather. It’s also important to make sure to plan on how much countertop space you will need for all built in appliances and preparation space needed. Like all kitchens, cupboards, and cabinets are essential. You don’t want to have to run in and out of your house to get all your cooking supplies. This becomes frustrating and can be very inconvenient. Having built-in cabinets limit this inconvenience and add the fun of choosing and designing your perfect outdoor kitchen cabinets. Adequate lighting in your patio allows evening meal preparation. Make sure that lights are placed accordingly. After all, who chops and slices in the dark? Besides, you need to be sure that the meat is rare, medium or well done. A convenient part of your outdoor kitchen and essential for meal preparation. Install a sink near the prep station for easy cleanup and adding water to recipes when needed. Should you get a full or small size refrigerator? It all depends on how much you plan to be outdoors. Regardless of the size you choose; the refrigerator will always be a crucial part of your outdoor kitchen. When it comes to flooring your outdoor kitchen, keep in mind that you don’t want a high-maintenance product on your floor. It’s better to go with concrete, natural stone or a skid-free tile. These options are easier to clean and are grease-repellent. Also, don’t forget to choose a flooring that it stylish and weather-resistant. You’ll be enjoying your outdoor kitchen once you have it up and running. 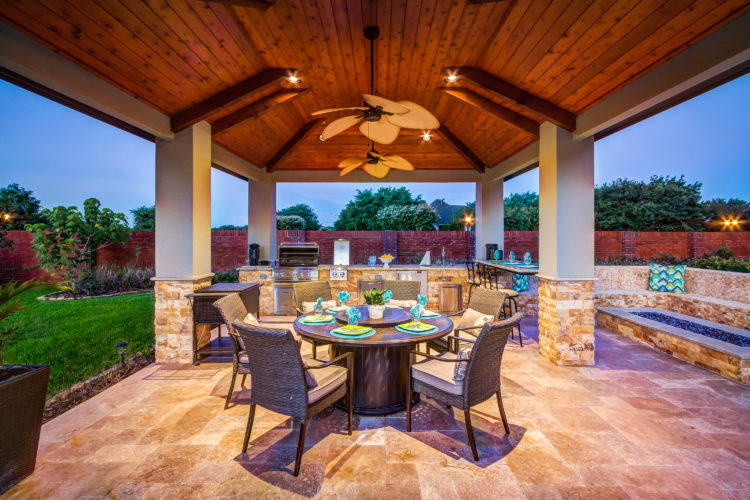 Are you ready for your new outdoor family room and kitchen? Don’t forget that Platinum Pools can walk you through the process. It all starts with a phone call at 281.870.1600 (Houston), 409.898.4995 (Beaumont), or 361.576.0183 (Victoria). Remember that Platinum Pools can prove the difference.